I first heard Jones play with the Roy Hargrove band about ten years ago when I was making regular trips to New York to hear the likes of Elvin Jones and Roy Haynes play. Hargroves band was playing a lot around NYC at the time or at least it certainly seemed so as they were always playing at the Village Vanguard or the Bluenote whenever I was there (!) In fact I clearly remember eating a slice a pizza at the joint directly above the Village Vanguard while Willie was taking a solo. I know I missed a good one (while eating my slice of course!) as the ground was literally shaking underneath me. I asked the older Italian gentleman working across the counter how he liked all the Jazz music coming from underneath him. "Well, it's alright I guess..." he replied ! 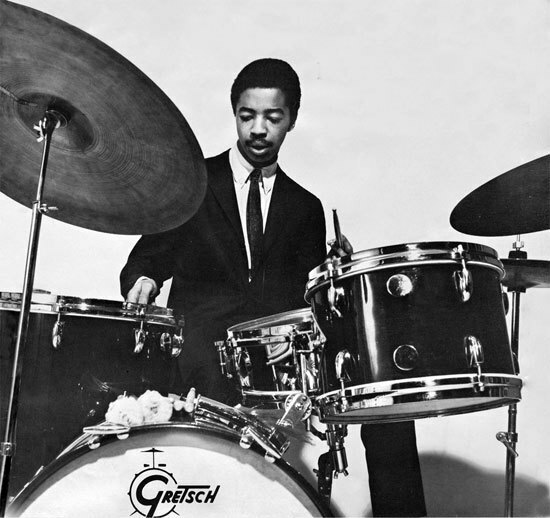 Today's lesson focuses on a pattern that drummer Philly Joe Jones commonly used and how my interpretation of his sticking pattern has evolved over the years. 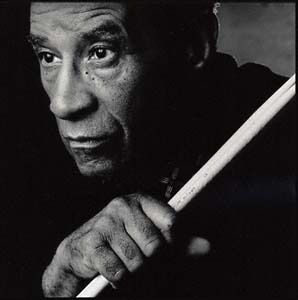 Jones was a devout student of the snare drum rudiments and regularly incorporated those and other sticking patterns commonly found in the drum texts of Charles Wilcoxin into his solo vocabulary. A common pattern that Jones used over the course of his career involved playing a repeated nine beat phrase of eighth note triplets. Listen to any record he did with Miles Davis and you're bound to hear it (among other albums of course...). 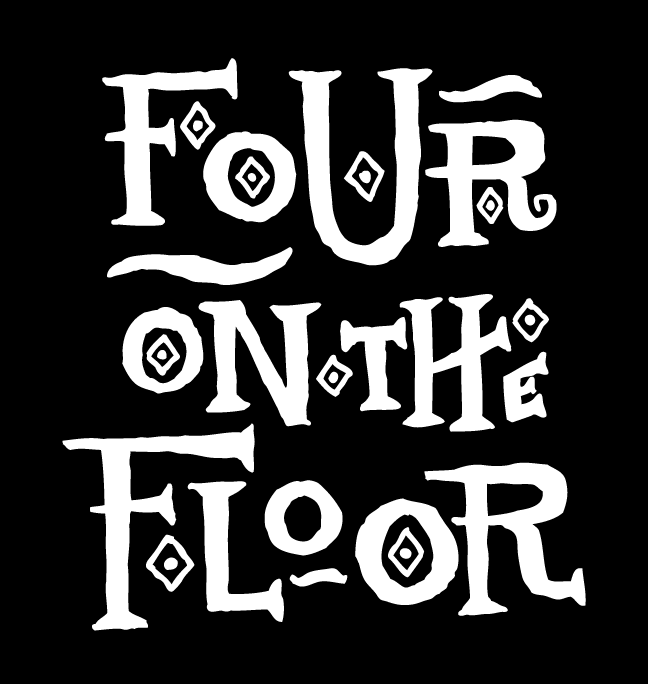 He would commonly play this pattern several times in a row as an over-the-barline type of phrase in 4/4, several times in succession. You'll also notice that the pattern alternates the accents between the right and left hands. However, after showing my transcriptions to my teacher at the time, Chris McCann, he informed me that Philly very rarely played single strokes and was more inclined to use some sort of combination of double strokes. Chris knew this first-hand as he was friends with Jones and at one time followed him around from gig-to-gig, studying him up close. This variation also leads with the right hand (rather than shifting the accents between the right and left hands) and I've got a lot of mileage out of this pattern over the years. 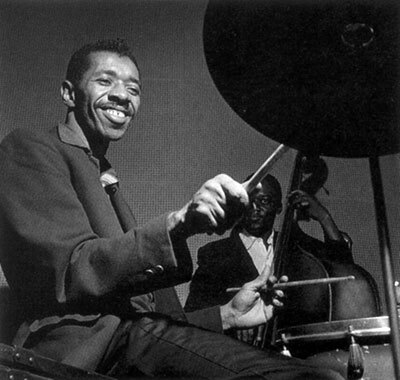 However, fast forward about fifteen years, and after some time hanging out with John Riley and hearing him talk about Philly Joe Jones' drumming and sticking patterns, I apparently had it all wrong ! If you'll notice the right hand still leads but the combination of double strokes is much different than mine. If you dissect the pattern even further you'll notice that the whole pattern is a basically a 3/4 ride cymbal pattern played with the right hand on the snare drum (1 2+ 3) with the left hand filling in all the missing triplets. Very logical and that's the genius of it !!! Of course any of those three patterns work and I try to use all three in my own drumming. The more ways you have to execute a given pattern, the better - I think. And it will only help you unlock and develop further interesting patterns around the drum set. Special thanks to my sister-in-law Siobhan Thomas who hipped me to this ! It's Thursday...With Roy Haynes ! 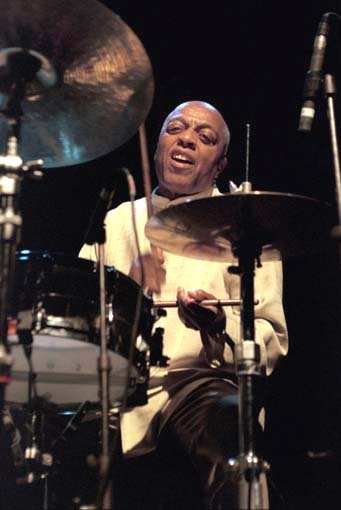 Indeed - Roy Haynes is the coolest drummer alive ! "Powell's Place" - Preview HD from Tutti Dynamics on Vimeo. Shannon Powell at WWL CBS morning edition from Howard Lambert on Vimeo. Shannon Powell takes over the FOX morning news from Howard Lambert on Vimeo. I first heard Shannon Powell on a Harry Connick Jr. television special on a CBC broadcast from London, England on New Year's Eve circa. 1992. 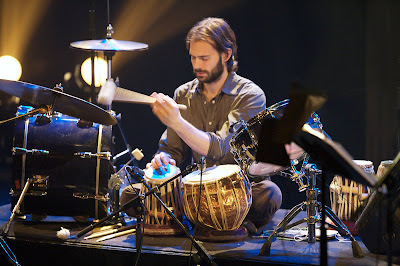 Most of the show featured Connick singing in front of his big band and an orchestra but the rhythm section featured the solid Shannon Powell on drums with Ben Wolfe on bass. The concert featured Connick playing piano in a trio format with Powell and Wolfe for a few numbers (selections from the soundtrack of "When Harry Met Sally" I think ?) 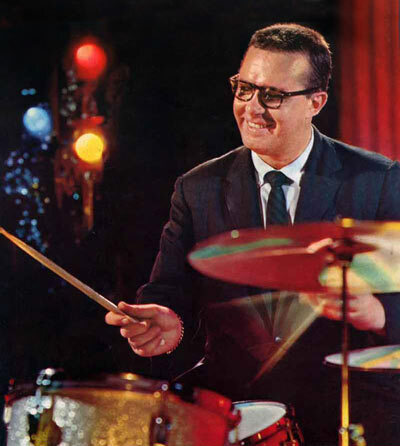 including a very hip arrangement of "Stompin' at the Savoy" which featured Powell on a contemporary, Gene Krupa inspired drum solo (with plenty of N'Awlins thrown in for good measure !). I wish I still had a copy of that. I'm guessing that this show with Connick and Powell was one my first exposures to Jazz on television and I was smart enough to record the concert on my parent's Beta Max recorder. Very influential for me at the time and I eventually wore that tape out ! Hope everyone had a pleasant weekend as the end of August (and the summer for that matter!) is quickly looming on the horizon. Where the heck did this summer go anyways ? - Someone in my comments section asked me to recommend my favorite Jack DeJohnette albums as a leader/sideman. Please feel free to chime in with your favorites as well. -I enjoyed a great gig on Friday night at the Beatniq Jazz & Social Club here in Calgary and was treated to a fine trio consisting John Riley on drums, Ralph Bowen on tenor saxophone and Kenny Davis on bass. They all sounded great and were all really stretching in their solos over a repertoire of classic standards. It was refreshing to hear such a high level of intensity and I really appreciated Riley's ability to accompany Bowen's long and developed solo's with such patience and musicality. From experience I know it's a challenge to pace yourself properly when playing with a tenor player (such as Bowen) who really likes to stretch and develop a solo over many, many choruses with such authority (paging my dear friend, Montreal tenor Al McLean here !). Also, the trio tackled a few extreme uptempo numbers and Riley demonstrated how it's done with text book precision and musicality. 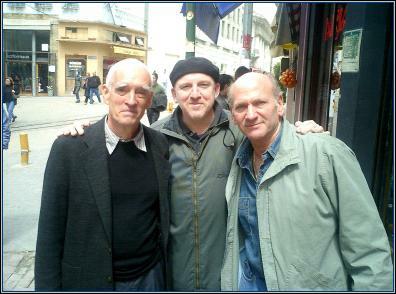 Riley and the others sounded GREAT and I would love to hear a recording of these three in the future. -I was also very fortunate to spend an evening with John Riley last week for a private lesson over at my studio while he was in town teaching at the Mount Royal University Jazz workshop. John is a very genuine human being and an exceptional teacher. We mostly talked about some different approaches to playing odd meters on the drums and he left me with more than enough things to practice and listen to for awhile (time to stock up on my Dave Holland Quintet albums...). John was also kind enough to share some amazing recordings he had on his iPod featuring a very rare and revealing interview with Tony Williams, some studio outakes from the "Miles Smiles" session (interesting to hear Miles trying to teach Tony how to play that classic groove on "Freedom Jazz Dance") and introduced me to the Joe Morello drum solo on "Sounds of The Loop" (at some points it actually sounds like TWO drummers...check it out it out if you have a chance). If you ever have the opportunity to hear John play (ie. just about every Monday night at the Village Vanguard with the Vanguard Orchestra), see him in a clinic or take a private lesson with him I would highly recommended it. 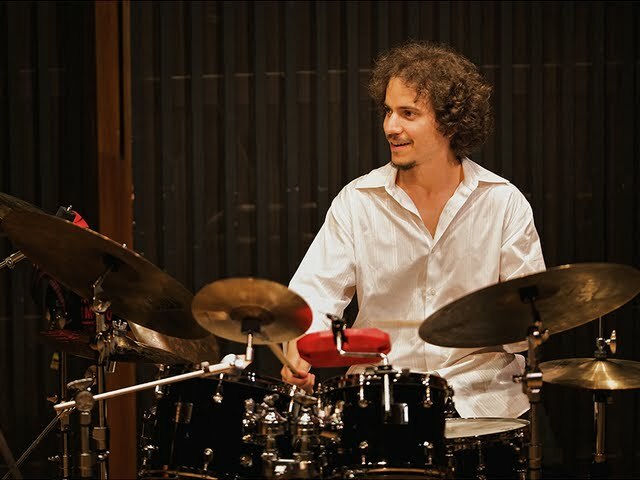 His knowledge of Jazz drumming and his ability to teach and explain those ideas are exceptional. - I've got quite a bit on my plate coming up over the next month so my blogging is going to slow down a little bit. Thank you for your patience and your continued support. - Hey does anyone know of some happening Jazz clubs in Rome ? Wow - I can only imagine what it must be like to play between those two guys !!! During my studies at McGill University in Montreal with drummer/pianist Andre White, studying Frankie Dunlop's approach to comping and his unique solo style was standard fare. His big, fat swinging eighth note feel is something quite different from his contemporaries and provided the perfect compliment to the rest of the Thelonious Monk band. For awhile I was also really into playing along with Monk records that featured Dunlop on drums with his rhythm partner John Ore on bass. I'm a big fan of the bouncy quarter note feel they got when grooving at medium tempos. Check him out ! 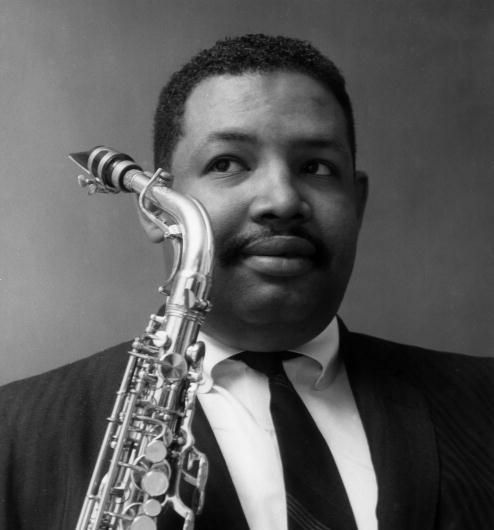 Of course his resume wasn't limited to his work with Monk and I would be very interested in hearing his other work with other band leaders as well. Any suggestions ? I saw DeJohnette and Surman play a duet concert like this at the Montreal Jazz Festival in 2001 and it was a life changing experience for me. I was sitting only a few feet from DeJohnette's drums during the show and it was a revelation to experience his nuance of sound and dynamics from the drums. Jack also played quite a bit of piano and that was impressive as well ! Notice how sharply dressed Mr.Roach is ! Joe Morello "It's About Time"
This album represents Joe Morello's first work as a band leader following his tenure with Dave Brubeck. 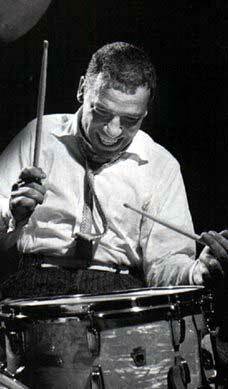 Some really inspired and swinging playing here from Joe in both sextet and big band settings. I think this is the first time I've heard Morello swing a big band ! 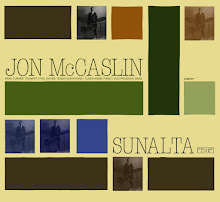 Someone was nice enough to post the audio of this album on youtube and special thanks to Mike Tarrani at www.drumz4sale.blogspot.com who brought this great album to my attention in the first place via his blog. It's always a treat to hear these three musicians play together. Their musical history goes back so many years and they really have a connection that only comes with having spent countless hours playing together. - Does anyone have a copy of drummer Joe Dukes' album "The Soulful Drums of Joe Dukes" he recorded with Jack McDuff ? I would love a copy of this one ! - The pen truly is mightier than......a drumstick ? 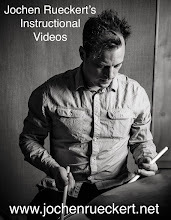 This is a variation I came up with based on a popular application of the exercises found in the book Stick Control to develop useful Jazz independence and comping skills on the drum set. So what you get is a constant stream of swung eighth-notes between your left hand and bass drum underneath the steady ride cymbal and hihat. This in itself will take some careful and persistent practice to master, so take your time. 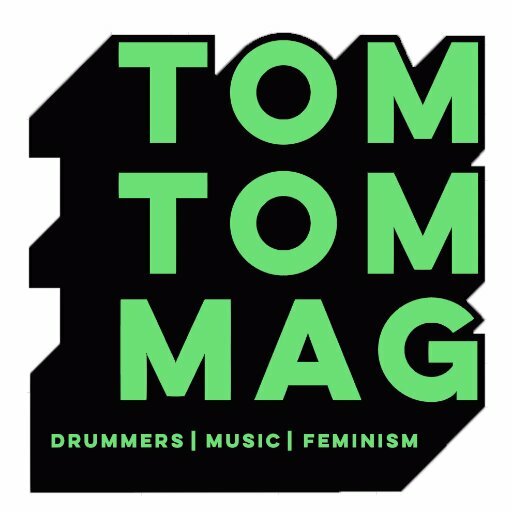 Don't forget to keep the ride cymbal beat on top of the overall sound or else it can easily get buried underneath the constant rhythms of the snare and bass drum. And of course if it ain't swingin', it's not going to work and sort of defeats the purpose ! 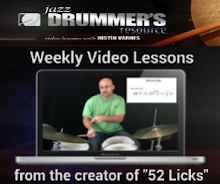 This is overall a very useful exercise to develop your Jazz independence skills. However, I don't think I've ever heard a serious Jazz drummer who's worth his mettle accompany a soloist with a constant stream of eighth notes between the snare and bass drum for measures and choruses on end ! Apply the sticking variations from Stick Control between the snare and bass drum using these cells and you'll develop a whole new vocabulary that is readily applicable to playing with other musicians. You'll find that you can take a simple rhythmic cell or "motif" and use it in several different and practical ways. See what other variations like this you can come up with on your own. As Bob McLaren likes to say: "Just something to practice and keep you off the streets!" Thank you to Saskatoon Jazz educator Nick Fanner who passed this on to me ! 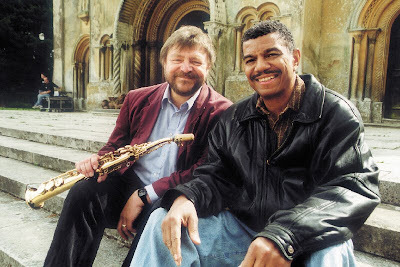 I've got an exciting gig coming up at the end of the month playing with the Gerry Hebert/Johnny Summers Quinet at the Beatniq Jazz & Social Club that will feature repertoire from the classic Cannonball Adderley Quintet. 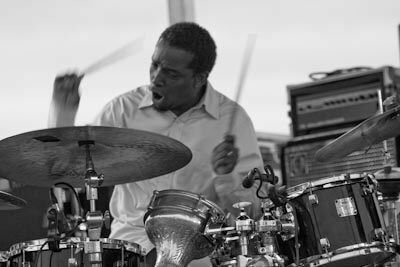 So I'll be checking out a lot of drummer Louis Hayes in the coming weeks. I caught this duet of Ari Hoenig and harpist Edmar Casatneda on the Small's feed last December. I really hope these guys have a duet recording project in the works ! Barry Elmes -"Different Voices" and "Time Warp"
Terry Clarke - "It's About Time"
Chris McCann - "Froggin' Around" and "Calypsony"
Ted Warren - "First Time Caller" and "Songs For Doug"
Dave Robbins - "At The Mark"
Joel Haynes - "The Time Is Now" and "Transitions"
Barry Romberg - "Random Access"
Thom Gossage - "The Now Beyond"
Michel Lambert - "Drum Duets"
- Hey does anyone know if Jerry Fuller or the elusive Claude Ranger ever led any recording dates as a leader ??? Measure and stir in the ingredients in a large bowl until smooth. For each crepe, lightly butter a skillet and heat over medium heat until butter is bubbly. Pour scant 1/4 cup of the batter into the skillet and immediately rotate pan until batter covers bottom. Cook until light brown; turn and brown on other side. Most people are amazed that you don't need one of those special crepe griddles, like the ones you see in restaurants. I use a large Wok and find that it works great ! Serve with large quantities of maple syrup and enjoy ! - Hey check this cat out ! I've never heard of him but he sounds great. -And last but certainly not least, here's a clip of my good friend and percussionist Memo Acevedo from an old SCTV clip with John Candy. There are also a few other Toronto Jazz musicians who make a guest appearance in this bizarre skit. Mambo ! I really dig Mela's wide open sound and style. Very Roy Haynes and Jack DeJohnette'ish with a distinct Cuban element thrown in. His inventiveness and sense of rhythm, pulse and orchestration really impress me everytime. Hope everyone is enjoying their long weekend wherever you may be. Don't forget your bug spray. Those little bastards are vicious these days !!! - A big thank you to Neil Corlett and all the staff and students who participated in the MusiCamp Alberta music workshop held in Red Deer last week. Lorna MacLachlan did a fabulous job of getting the vocal Jazz students to sing together and it was a delight to back them up in the rhythm section with bassist extraordinaire Stefano Valdo. Also some very nice moments during the Friday evening faculty concert with saxophonist Mark DeJong and trumpeter Joel Gray joining Lorna, Stefano and myself in a quintet that performed Lorna and Mark's original compositions. - Thank you to George Marsh who kindly emailed me the other day following my previous post about him and Matt Wilson. You can learn more about his fine recordings and books there. If you dig around there are also a number of interesting percussion metronome .mp3's you can download to play along with. - Looking for something to practice during the summer doldrums ? Check out Pete Lockett's online snare drum book "Symetrical Stickings For The Snare Drum" here. Some really interesting approaches to applying paradiddle'ish stickings to create interesting and practical patterns. Oh yes, and it's free ! If you poke around his website you'll find many other great things to practice as well that should keep you occupied for several summers !!! Thanks to Peter Hum of the Ottawa Citizen who made me aware of this. 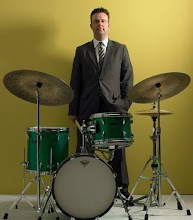 Drew was a fine drummer and long-time accompanist of Oscar Peterson and British saxophonist Ronnie Scott.